This upscale smoke free guest house in Conway is less than one mile from Conway Castle and features free self-parking facilities. Each of the six guest rooms at Glan Heulog includes a TV with digital channels, a phone and a hairdryer. Infant cribs are available upon request. This Victorian guesthouse provides guests with tour/ticket assistance at reception, while a lobby fireplace will make sure that visitors keep warm and cosy. Airport transfers are available for an extra a fee. A complimentary breakfast is provided each morning, or visitors can choose to dine at one of the many fine dining establishments in the town of Conway. 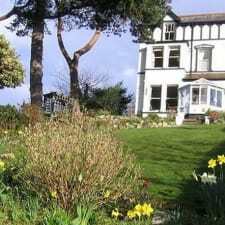 Bodvsgallen Hall is just more than a two mile walk from Glan Heulog Hotel, while the West Shore Beach and North Shore Beach are within a six mile drive. Most guests leave this vacation spot feeling like they have been able to totally relax and unwind in a comfortable, secure environment. The homely atmosphere is perfect for those who wish to spend most of their vacation in pristine gardens, yet comfortable surroundings. Many guests book their next trip before they even leave. Reports of crispy clean linen and spotlessly clean rooms are what most guests have found at Glan Heulog Guest House. This is the reason that visitors say they feel well looked after, while gardens and surroundings are just as pristine and well-tended to. Many guests have commented about the secure environment at this guest house. Parking is totally secure, while you can simply walk to town to see the castle, or peruse the many unique gift shops in the area. If you are a traveller with a disability, then perhaps you might find the parking at Glan Heulog Guest House a bit of a hassle. There have been a couple of reports from guests with walking difficulties, who reported finding it awkward to navigate the steep slope. There are no more negative reviews for this property.